Earlier we had discussed how to create a new drive inwindows direct from the desktop.The tutorial was based on drive creation from available free space, now we are going to deal with making free space from existing drives without altering any files of that drive or without deleting that drive. We are going to elaborate how to shrink a drive in windows without any data loss. Now the level of hardisk partition is quite high. 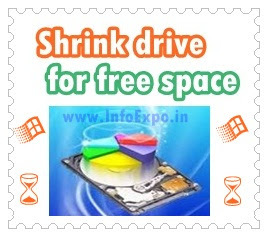 This process works by gaining GigaBytes from existing drives such a drive containing Operating system or from other all drives in your system which have enough free space avilable. The base of tutorial is shriking of an existing drive, for example 90GB is ‘shrink’ to 50GB ; thus 40 GB has been moved to free space. 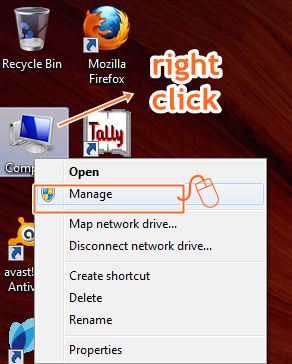 *Using this tutorial you can shrink drive in which windows OS is installed, perfect shrinking by reading this tutorial won't affect you windows files. 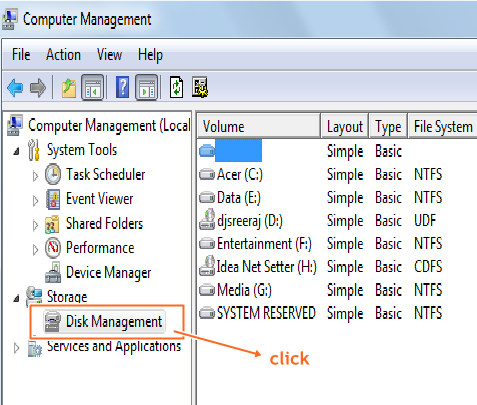 Now click on disk management option, now complete details about your drives can be seen. 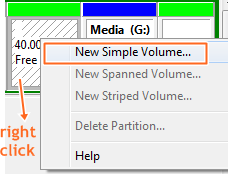 After right clicking select the Shrink Volume option. Wait ultil any new box appears..
Now check the amount of new available free space in your disk management window .